Most texts on harmony follow a similar path from triads to seventh chords: first you learn the three-note chords you can build by stacking thirds, and then you look at the four-note chords you can build by adding a seventh. In this jump from three to four notes, there’s a fundamental question we pass over: how many types of three-note chords could we build if we weren’t limited to thirds as the building block? There’s so much complexity in seventh chords and their extensions that it’s easy to get lost and never return to the three-note universe to fully map it out. A list of all the possible three-note chord types (or trichords) crops up in a number of places, but as far as I know it hasn’t become part of “mainstream” music education. You can find it in atonal theory (which has various ways of labeling all possible “pitch class set classes”), in Hindemith’s Craft of Musical Composition, in various explorations of math and music (in particular Michael Keith’s From Polychords To Polya), and in some online resources. What I’m hoping to do here is provide a simple way of examining this question, since I think it deserves more attention that it gets. So how do we find all the three-note chord types? In my post on Musical Clocks I reviewed the idea of representing a three-note chord as a division of the clock face into three slices, made by the three hands of the clock. A chord type can be seen as a pattern or template for sizing and arranging those slices: for example, any major triad divides the clock into a slice of size 4, followed by a slice of size 3, followed by a slice of size 5, reading clockwise. This is the same as saying that a major triad divides the octave into a major third (4 semitones), a minor third (3 semitones), and a perfect fourth (5 semitones)–with two of those intervals audible at any given time, depending on what inversion is played. By spinning the major template (4/3/5) around the clock in increments of one hour, we can create twelve chord instances (C maj, C# maj, D maj…), one for each landing position. Remember, what we’re trying to count in this post are templates or chord types, not instances or actual chords. In fact, not every chord type generates twelve distinct instances (hint: augmented), so we can’t simply divide the number of possible three-note combinations by 12 to get the number of chord types. Go ahead and try it though: (12 choose 3) = 220. That’s the number of ways we can pick three notes from the octave to create a chord instance. Divide 220 by 12 and you have 18.33333…. which isn’t an integer! Now, one template for slicing up the clock is “equivalent” to another (it represents the same chord type) if we can rotate them so they line up. For example, you might make your slices at 12 o’clock, 4 o’clock, and 7 o’clock, and I might make mine at 12, 5, and 9. Starting from 12 and reading clockwise, your slices span 4 hours, 3 hours, and 5 hours; while my slices span 5 hours, 4 hours, and 3 hours. If I spin all of my slices as a unit around the center of the clock face they’ll eventually line up with yours, because my slices are sized like yours and occur in the same clockwise order. In musical terms, we’ve both built major chords and I can make the notes of my chord match yours by transposing them all by the same interval. 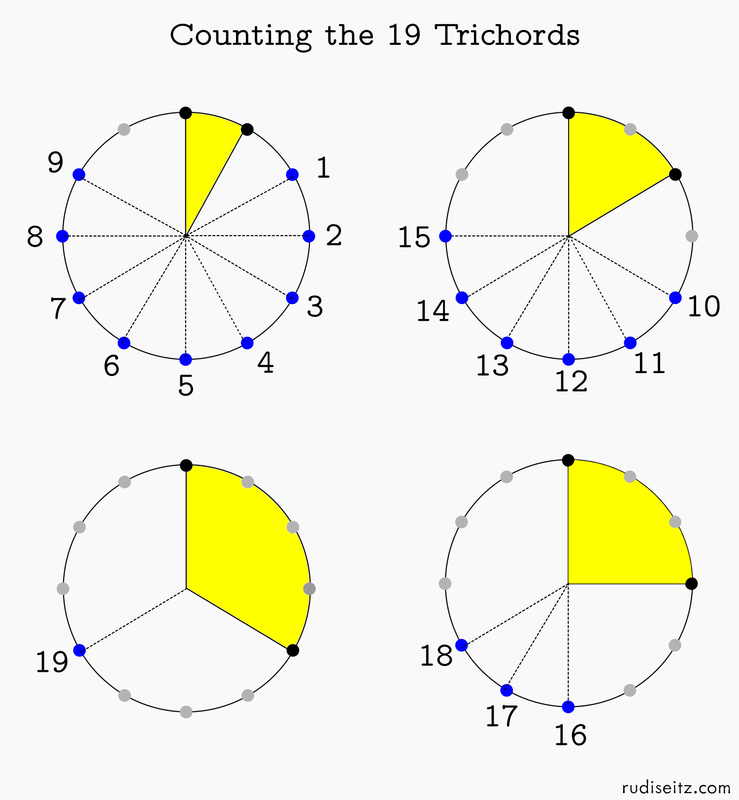 But if my slices were of size 3, 4, and 5 (reading clockwise) I’d have built a minor chord: there would be no way to get my slices to line up with yours on the clock face, and no way to transpose the notes of my chord so they match yours. So the question, “How many types of chords can we create with three notes?” is the same as asking, “How many distinct templates are there for separating a clock into three slices?” Again, “distinct” means that we can’t spin one template around to match another. Now it turns out that the generalized version of this question–where you have an arbitrary number of hours (or possible slicing points) on the clock, and you’re making an arbitrary number of slices–is difficult and requires a tool called the Polya Enumeration Theorem. We don’t need anything so powerful, however, since we’ve only got 12 hours on our clock and we’re only making three slices. We can count all the possibilities by hand without too much trouble. What we do need is a systematic way of counting, so we won’t include duplicate templates in our count. Let’s organize our count around the smallest slice size that occurs in each template. In a minor triad, for example, the smallest size interval is 3 semitones (the minor third). In a diminished triad, it’s also 3: in fact we’ve got two slices of that size. In an augmented triad, the smallest size is 4: the chord is built entirely of major thirds. I find it intriguing that the markings on these four clocks represent all of the harmonic possibilities in the three-note universe (within 12-tone equal temperament, that is). The standard triads are on the bottom two clocks: 16 is diminished, 17 is minor, 18 is major, 19 is augmented. In my followup post, I take a closer look at all 19 trichord types shown here and examine the musical significance of each one. Think about it, any complex chord you’ll ever play will be made of some combination of these 19 trichords–they are worth getting to know! Nice work. And many thanks for making these diagrams.